Auckland housing developers could face growth infrastructure targeted rates under Budget proposals announced by the city’s new mayor. In a bid to boost the city’s revenue, while keeping a cap on rate increases and funding much-needed infrastructure growth, Auckland mayor Phil Goff has issued a set of proposals for consultation. Goff’s proposals include the introduction of a targeted rate for new large-scale developments, along with a visitor levy and a regional fuel tax. “Ratepayers have shouldered the responsibility for the growth of our city and cannot be expected to continue to do that on their own,” he said. Goff’s proposal aims to meet the challenge posed by years of underinvestment in infrastructure, coupled with ongoing rapid population growth, and to support the aims of the Unitary Plan. The land opened up by the Unitary Plan includes 11,000 hectares in new greenfield areas and these areas will require substantial investment for new roads, sewers, water pipes, parks and community facilities. The proposed growth infrastructure targeted rates would sit alongside the existing development contribution and infrastructure charges. They would spread a lump sum charge out over time as an annual payment, and could be triggered ahead of development occurring. It is expected the rates would increase land holding costs and weaken the incentives for landbanking – which was an issue Goff campaigned on. Additionally, it would create a closer link between rates paid by landowners in a specific area and the uplift in the value of their land due to it being available for development. 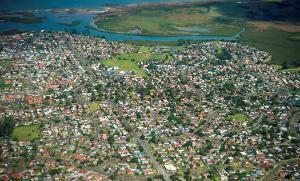 The proposal also states that where the rates are applied to large scale developments of thousands of houses this should assist with efforts to place downward pressure on land price increases across the Auckland region. To further assist with Auckland’s infrastructure needs, Goff said the Council is also preparing a funding application for the Government’s Housing Infrastructure Fund. Prominent Auckland developer David Whitburn said the targeted rates would be for large scale developments in greenfield areas that are not currently serviced. Such areas are often fringe areas, and cost many multiples more to provide roading, power, water, stormwater, sewer and other amenities, he said. “We have not had this policy right for many years, and it is a sensible idea to charge targeted rates for developments that have little or no development infrastructure in place. However, Whitburn said there doesn’t appear to be any change to those investing in serviced urban areas. In his view, this is a missed opportunity from the Council, who could help housing affordability by lifting the costs of the red tape. “There should be a significant additional cost if you develop in a future residential zone as opposed to a mixed housing urban or terraced housing and apartment zone. The mayor’s Budget proposals will be presented to the Council’s finance and performance committee tomorrow. After the Council's governing body prepares the draft Budget for consultation, the proposals will be released for public consultation in February and March. Following consultation the budget will be finalised before being adopted in June next year.